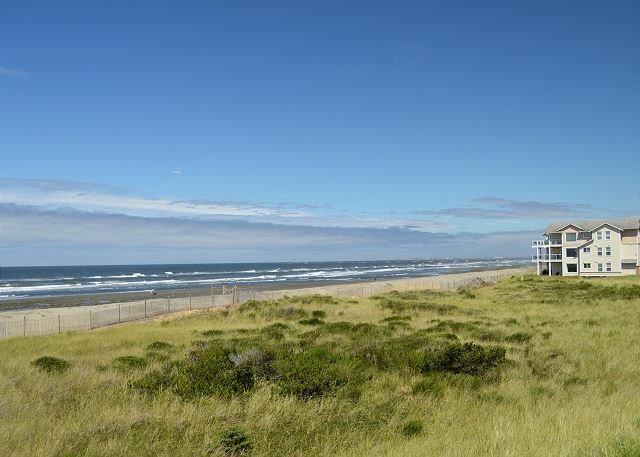 Enjoy the spectacular ocean view in this comfortable oceanfront home. This condo is only steps from the beach with a 180 degree unobstructed ocean view from both the living room and master bedroom. You are sure to enjoy your days here while listening to the sound sof the ocean lull you to sleep at night. A private balcony offers a comfortable place to lounge and enjoy the sound of the waves crashing on the beach beyond. This two bedroom unit provides lots of space for a group or family. The condo was clean and comfortable, updated furniture in the living room. Nice deck with great views! Easy access to beach. Wish we could have stayed longer! Beautiful, well appointed, and comfortable condo with dramatic views of the dunes, beach, and ocean from the living room and master bathroom. Only steps away from beach-combing followed by a quick return to warm up in front of the fire while watching the sunset over the breakers. We have stayed in several units at Vacations by the Sea. This was probably one of my favorites. The furnishings are beautiful and the view cannot be beat. What an amazing place. We stayed for a Month while we were out working in Westport! Our view of the Pacific Ocean was stunning, to say the least. The beach there has to be one of the cleanest we have been to in a long time. The facilities are top notch and I don't think we could have found a better place to stay. It was a breath of fresh air every time out on the balcony. The housekeeping was very discrete and did an excellent job! I would recommend Vacations By The Sea to anyone looking for a great stay on the beach! We really enjoyed staying in this rental condo. 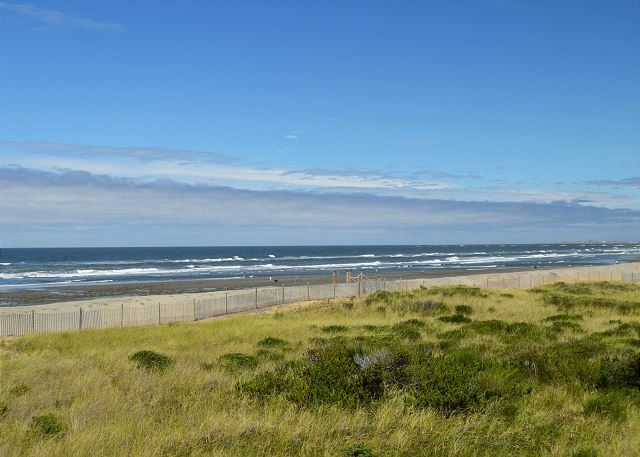 Excellent location with a fantastic view and easy access to the beach. We also enjoyed using the heated pool and hot tub in the clubhouse! The condo was clean and well stocked. The kitchen was very well supplied with everything we needed to cook for ourselves during our stay. Check in and check out instructions were clear and simple. We were able to use the lighthouse trail and walk to the harbor - it's about 1.5 miles, but an easy paved trail. We came mostly for the beach and this place did not disappoint! Very comfortable, beautiful view everything you would need. Thanks for staying and happy to hear you enjoyed the great view from this condo. It really does offer a unique oceanfront view you just can't find many other places. The condo was perfect. It was very clean and furnished nicely. 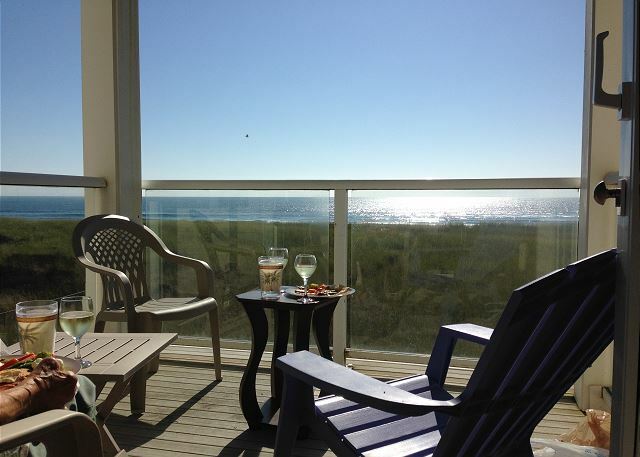 The view of the ocean was amazing, we would open the door on the balcony and enjoy the sound of the waves...relaxing. This unit has an exceptional view! It is very tastefully decorated with lovely items, however the couch and loveseat are pretty broken down and need replacement. The kitchen is stocked with anything you'd imagine needing in the way of dishes and utensils. The beds are terrific, very comfortable with beautiful comforters. The electric fireplace and telescope were great additions. Also appreciated the available games and books. Very pleased with the vacation rental in every way. I hope to return another year! Spending 30 days at Vacations by the Sea is a "home away from home". Gorgeous view, gorgeous décor, perfect place to start the new year! Thanks for staying with again, we're so happy to hear you enjoyed this condo as much as the others! See you again next time. Our family stays at Vacation by the Sea two to four times a summer and have always really enjoyed our experience. We have been very impressed with all the units we have stayed in and this is our grade school children's favorite place to go. Our experience with renting and staying in the condo was great. We drove right to the condo and the keys were in the lock box. We walked into a beautifully decorated and clean Condo with a complete kitchen. The bedrooms and bathrooms were very comfortable and there was even robes we could use. There was also games, books and movies we could watch. The best part for us was that the balcony looked out over the beach and it only took a couple of minutes to walk to the water. We visited the central room with the pool, hot tub and exercise room and if we stayed longer, we would definitely use it. We will be back for a longer visit and will bring our friends! This condo was perfect for our mini vacation on a long weekend. It was easy to get to, located in an excellent spot, and the service was great. The condo had everything we needed, and the view was wonderful. Amazing and wonderful . Our condo was absolutely gorgeous. The view from each and every window was spectacular ! The condo was well appointed and so very comfortable. We enjoy staying at Vacations by the Sea because we know it will be clean, the staff will be helpful and friendly, and it's a great place to stay and be comfortable. arrived with 5 family members and husband. great location on the beach, all the needed amenities, etc. truly enjoyed our stay. The woman who answered the phone was very nice. I was calling with short notice and she was able to accommodate me. She described the two properties available and I was able to make my decision based on her help. I have been here twice and will go again. Very impressive when you first walk in - all you see is the beach and breaking waves. Unit is large and had everything we needed. Has great covered porch, so you don't have to sit in the sun all day, with a magnificent 180 degree view. Would stay here again. This is a great spot, perfect beach get away. This is our 3rd year at this resort and 2nd at this particular condo for our annual New Year's getaway. As before, we are completely blown away at the accommodations, the view, and the amenities. Clam digging, fresh crab from the docks, the Westport residents, and bonfires on the beach were part of our good time, and the weather was absolutely amazing....warm and no wind. We thoroughly enjoyed our stay. It was stormy but that made it more interesting. Everything went smoothly and we will definitely come back. We really love the quiet and relaxing experience that we get here. The perfect get-away. 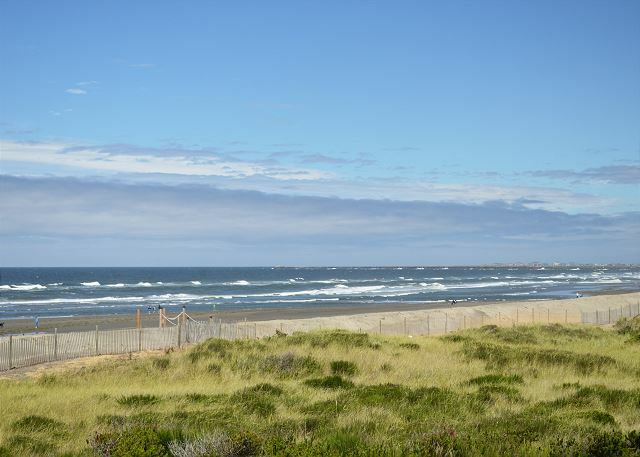 Rental unit 122 is spacious with great views of the ocean. We had a great experience and will come back. I think our only problem was first trying to find the location of the condos, but it was nothing but smooth sailings and relaxation after that. The view was incredible and the rooms were perfect. I plan on coming back many more times in the future. Nice location, excellent views from living/master bedroom. Outstanding view of the ocean. Beautiful large condo. This is the 2nd time we stayed in this condo. Again it was another relaxing stay. The condo was clean and had everything we needed. Looking forward to next years annual girl's weekend. Rental was terrific - we had an ocean-front, beautifully decorated, comfortable beds and all amenities as advertised. While the wall phone didn't work, we got an immediate response that it would be fixed. This is a great place to hide out and get some R&R, very quiet and well maintained. Don't expect much from Westport itself though, a lot of restaurants and stores were closed. All apartments are not equal (depending on the owner) so make sure you look at all the pictures before picking one to rent. My wife and I celebrated our 14 anniversary in this wonderful condominium. The unit was clean, quiet and well appointed and as close to the beach as possible. Glad you had a wonderful stay in the condo to celebrate your wedding anniversary. Hope to see you for your 15th next year! The condo was beautiful. Had my mom and sister visit from Phoenix. They loved it!! This was the second time I stayed at one of these condos. Love it both times. The condo itself was spacious, clean, and comfortable for the four of us on our Mom/Daughter get-away. We checked out the hot tub but it was too cool for our liking, so we ended up staying in for the evening. The beach access is easy. Our walk was gorgeous. We went to the Fish Shack for an early lunch and the food was delicious! Perfect 24 hours for the four of us -- filled with laughter! We will be back!!! 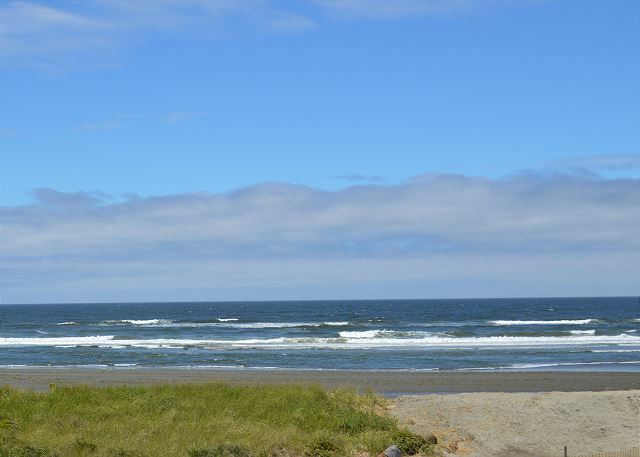 Wonderful place to stay to enjoy the ocean and the fishing village of Westport. I took a friend for her birthday and couldn't have asked for a better spot. The condo was very well stocked, the view was spectacular and the weather was terrific. We will do this again, for sure! Wish we had been told about inaccessible stairs due to repair; also would be nice to have directions explaining the weird garbage disposal. Otherwise, we loved this unit! this was a perfect condo for our family! beautiful views and so close to the beach - I only wish they had a typed-up something in the condo that tells you how to work the garbage disposal!!! ha!! Fantastic spot! Waking up every morning to the sounds of the ocean just a few hundred feet away was incredible. Everything about the location and details of this condo was perfect and "as-advertised". It was actually much better stocked with plates, silverware, utensils, etc., than we anticipated. The ONLY thing we didn't care for was the bed in the master bedroom. Now don't get me wrong, it was a nice bed, just much too soft for our liking. This is a personal preference of ours, so I am not dinging the rating of the condo. Everything provided by Vacations by the Sea, from check-in to check-out was super easy and a pleasure to deal with. Weather in the area can be spotty, so increase the length of your stay and hope for sun! Had a wonderful 3 night stay in this condo. It was very clean and kitchen was well stocked with everything we needed. Beautiful view of ocean from kitchen/living room and master bedroom. The only issue we had was there was electrical issues in master bedroom. Outlets along wall TV was plugged into didn't work. Overall a wonderful place. Looking forward to coming back again. One night stay. Very clean in a great location. Will stay here again if we get the chance. This is a great second floor condo. We stayed at this complex last year and had a great time. Very easy access to the beach, plenty of parking. The pool is well kept and a good temp. Dining in Westport-we have one GF family member and planned to eat out one night. It seemed every restaurant only had fried seafood. Happy to discover Half Moon bay does have GF pasta along with a few other choices. The dining experience was good but the kitchen is slow. We stayed for three nights in this great condo. It was the perfect spot for our family. The ocean was beautiful, and the condo was wonderful. Highly recommended! I did not have time to write down in the guest book our wonderful stay at this beautiful location condo. However we had a great, relaxing, enjoyable, time at this condo. We even had a very beautiful view of the sun set and sun rise during the weekend. My 15month old loved the place and enjoyed the balcony and view and fresh breezy through her hair. My parents enjoyed the stay as well. We will definitely be back again. We are from Sunnyside, WA and would recommend this particular condo to couples, families, or even for a quick get away. The rooms and condo itself was very clean, nice decor, and child friendly. We were able to go to the beach and enjoy evening and morning walks in the warm sand. My daughter even enjoyed it a little to much and ate some of the sand. LOL :) Best place. There is also a pool and activities for the kids to do there we did not get the chance to enjoy and go in the pool but rather enjoyed our view and walking on the beach. BEST PLACE TO STAY AT!!! This property was everything we could have wanted. The view was great, and everything was provided that could make our stay comfortable. We really liked the checkin process. The key was left in a lockbox at the door and we were give the code to access it. No problem of finding a rental office and standing in line. This was our third year to stay for a month in #122 and we look forward to many more April's. It is a wonderful retreat. Beautiful place to stay. Had everything you could want. Even a kite for flying! Wonderful weekend! What a beautiful oceanfront condo! My only complaint (very minor)--no coffee filters for the provided pot. There was a basket full of the standard hotel provided coffee supplies to tide us over till our grocery store visit! We had a fabulous time! Will be back for sure! 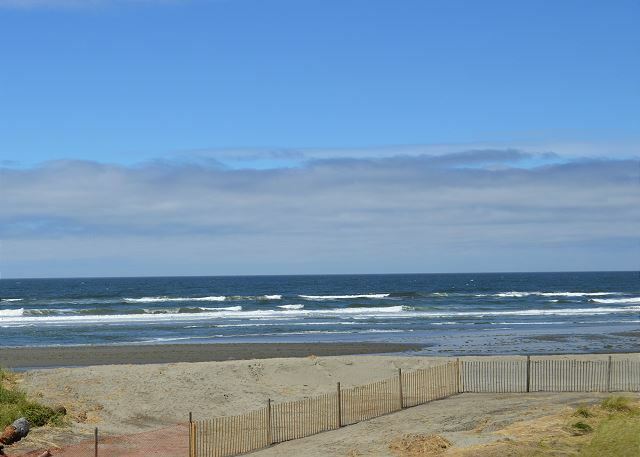 We're glad you had a wonderful visit in our Oceanfront condo. We provide an assortment of tea's and Hawaiian Kona coffee which do not need paper filters to brew for our guests the enjoy during their stay. Living in the Pacific NW we of course understand many guests perfer to bring their own coffee and it is a good idea to bring a long a few filters as well if you plan to brew your own as not all the condos will have paper filters. Hope you see you again soon! We stayed at this property with my parents and our three-year-old daughter. While it was cold, the weather was beautiful and we had amazing views of the occasional storm rolling in. The property was very clean and had all that we needed, kitchen appliances/utensils, games, movies, even a telescope and binoculars! Our daughter keeps asking us when we can come back, which means we'll be back for sure! Thanks for a great getaway. Thanks for staying with us and we're glad your family had such a wonderful visit. We love to hear the kids love our property as much as the parents! Hope she had fun at the playground and you all can visit us again in the spring or summer when the weather is warmer and the pool is open. Could not have been happier with the location and the condo. It was exactly as shown online with every amenity we could have needed. Will soon book same condo for another stay. This was our fifth time staying at Vacations By the Sea and our third time staying in Unit 122 with our grandchildren. To them it is like coming home to our own place. The weather was so beautiful and they played in the surf, searched for sand dollars and swam in the warm outdoor pool. Unit 122is absoutly beautiful and charming. There is nothing like sitting from the living room or the deck watching the waves come in. We will be back again and again. Fantastic Vacation - will go back again! It was more than we had hoped for! Beautiful room! Fantastic location! Friendly little community with lots to offer! Can't wait to go back!! We always love to hear that we exceed our guests expectations as that is one of our main business goals here at Vacations by th esea. See you next time! This was by far the best Westport vacation I have ever taken. The condo has a spectacular view and gives a feeling of being secluded. I have stayed in a couple of other units and this is by far my favorite. Nice, roomy, clean accommodations with great views to watch the crashing surf. Thanks for staying with us and we hope you can visit again soon! We have stayed at Vacations by the Sea on a number of occasions and this was our most beautiful view yet. We will certainly be returning to this room! Thanks for spending Thanksgiving with us a Vacations by the Sea, we're so happy you enjoyed your condo, we love the view as well! Great unit and excellent view. Only thing I would change is full tub rather than walk in shower. Thanks for the high marks on the condo and the feedback. We've heard from many guests they specifically choose this condo not only for the stunning view but also because of the shower and no need to step over a high tub wall. We do have over 45 other condo's we rent with many offering large jetted tubs and a great ocean view so please let us know next time and we'd be happy to help you select the best condo for your needs. One of the best condo's I have stayed in. Thanks for the nice comment, we're glad you enjoyed your stay at Vacations by the Sea and hope to see you again soon! We love Vacations by the Sea! as soon as you walk in the door. What a wonderful way to spend our vacation. We plan on coming back again and again. Extremly well maintained and equipped unit, it was very clean and very relaxing and had a great view. The deck above leaked water below to our deck when it rained or there was moisture in the morning, that was the only real problem. Overall it was very nice! No Need to Stay Anywhere Else on the Coast! We were very pleased with our stay at this property. We will definitely be back. We're glad to see you gave us such high marks and regret the problem you experienced with the internet when you first arrived. Once you notified us of the problem we immedately had our maintenance person take care of the problem and the wireless internet was working afterwards. We hope you enjoyed the free wifi during the remainder of your stay at Vacations by the Sea! Too short, we only had one night - but a great time was had and we will be back soon. Super comfortable bed and beautiful decor. Of the various condos we have stayed in at Vacations by the Sea, this was our favorite. The view of the ocean is magnificent. The condo is very well stocked with many really nice amenities. We would definitely stay in 122 again! a handful of friends & i celebrated my birthday @ wbts condo's in westport & we had an absolute blast,the condo was beautiful,clean,awesome view...totally loved everything , & trish @ the front desk was great...will totally recommend all friends to have celebrations there !! Thank you very much for your kind remarks. I'm glad you had such a good time at Vacations by the Sea and we hope to see you again soon! A great get-a-way with very nice accomidations and friendly staff. We enjoyed our stay and will stay there again when we can enjoy the beach more. We have already recommended Vacations by the Sea to our friends. Very comfortable sleep accomodations. Beautiful view from Deck, living room & master. Kitchen was well appointed. Clubhouse & Pool area very nice. Would book again. It would have been nice to have a place to change in and out of your swimsuit at the pool. I didn't like the fact that you paid $75.00 for a cleaning fee and then had to haul out your own garbage. What a wonderful place to vacation. We loved being steps from the ocean and the ocean view was just beautiful. Everyone was very helpful,and our condo was so nice, it felt like being home. What more could a person ask for? We can't wait to come again next year! We love staying at Vac. by the Sea! My mom and I come here annually and always love the accommodations. Unfortunately, the hot tub was out of service. That's my only complaint! This place was great. The owner's thought of everything.Can't wait to go back with my husband. Very clean and homey. The weather and the veiw were fabulous. Wonderful view and nicely appointed space. This condo is advertised as a 1.5 bath but is really a 1.75 bath which was a nice surprise. The only issue in this place was the second bedroom faced the front where all of the building lights were and there was not suffient covering on the windows to make the room dark enough to sleep.